Throughout the animal kingdom there are a variety of animals that have bizarre methods of deterring predators: squid eject clouds of ink, skunks exude clouds of stank, and sea cucumbers eviscerate clouds of their internal organs. But even stranger is the defense mechanism of the greater short-horned lizard (Phrynosoma hernandesi). No bigger than a credit card, this miniature dinosaur lives in Canada’s very own Jurassic park. Sadly, just like the dinosaurs 65 million years before it, extinction is a real possibility for the greater short-horned lizard. Back in 2012 I embarked on an epic adventure to photograph the rarely seen Pacific giant salamander. It was a journey akin to that of Sir Lancelot’s quest for the Holy Grail and I worried such an expedition could not be out done. However, just over a year ago I began tackling what I figured would be a near- impossible feat - to find a greater short-horned lizard. This would be like NASA searching for life on Mars using only a pair of binoculars - in fact the lizard’s preferred habitat isn’t that unlike the red planet’s surface. To give you a real sense of how difficult finding this lizard truly is; even the best researchers are lucky to find a single lizard for every ten kilometres of searching. Researchers at the University of Alberta working with Parks Canada went as far as using dogs specially trained to detect the lizard’s scent - though ultimately the pooches didn’t increase detection rates. They’re incredibly challenging to spot for a few reasons. For starters, the greater short-horned lizard is an ambush predator; lying in wait for prey to cross its path means you’ll never encounter it out on the prowl. When threatened the lizard ignores both fight and flight; remaining completely motionless to avoid detection. However, for some animal being stationary doesn’t equate to being unseen if one easily stands out. Luckily, the greater short-horned lizard has seriously impressive camouflage to maintain its cloak of invisibility. Unless it’s seconds from being squashed by a merry band of coconut wielding knights, the greater short-horned lizard’s first instinct is to remain perfectly still. Despite their best efforts, the greater short-horned lizard still finds itself on the menu of a few worthy adversaries, including raptors, snakes, and coyotes. However, the lizards have evolved a rather peculiar method of warding off would-be-predators. From ducts in the corners of their eyes, the lizards squirt blood with considerable accuracy. This defence is primarily used against foxes, wolves and coyotes, as the blood is laced with a chemical canids find noxious. The lizard’s ocular geyser is made possible by the extreme buildup of pressure blood pressure in the region behind their eye - the pressure is so great that blood typically reaches over a metre. Young greater short-horned lizards prey almost exclusively on ants, which are filled with critical freshwater. Unlike other species of horned lizards, adults diversify their diets to include beetles and grasshoppers. They’re a viviparous species, meaning females give birth to live young instead of laying eggs and a clutch ranges anywhere from five to fifteen offspring. Young are born with an average total length of twenty four millimetres and at only a few hours of age they’re able to fend for themselves. A fully grown female averages seventy millimetres from snout to the base of their tale. Males are slightly smaller and both sexes tip the scale at a whopping ten grams. In Canada the greater short-horned lizard is only found in four isolated areas in southeast Alberta and four much smaller and equally isolated areas in southwest Saskatchewan. Together, the 132 square kilometres of Canadian range accounts for less than five per cent of the species global range. The lizards prefer dry or semiarid environments, require loose soil or sand for burrowing and ideal real estate will neighbour an anthill or two - this usually ends up be south facing shale scree slopes of badlands or coulees. Sadly, there is an additional reason why greater short-horned lizards in Canada are so infrequently seen - they’re population is dwindling. Population estimates of mature lizards range from 2,500 to 13,000 across both Saskatchewan and Alberta. The biggest threat facing the greater short-horned lizard is habitat loss. Whether it’s due to industrial infrastructure expansion, road construction, dam and irrigation impact, agricultural cultivation or high-intensity prolonged grazing; these lizards are quickly running out of suitable habitat. There are only seven species of lizards native to Canada and personally, I find the the thought of losing even one to be frightening. 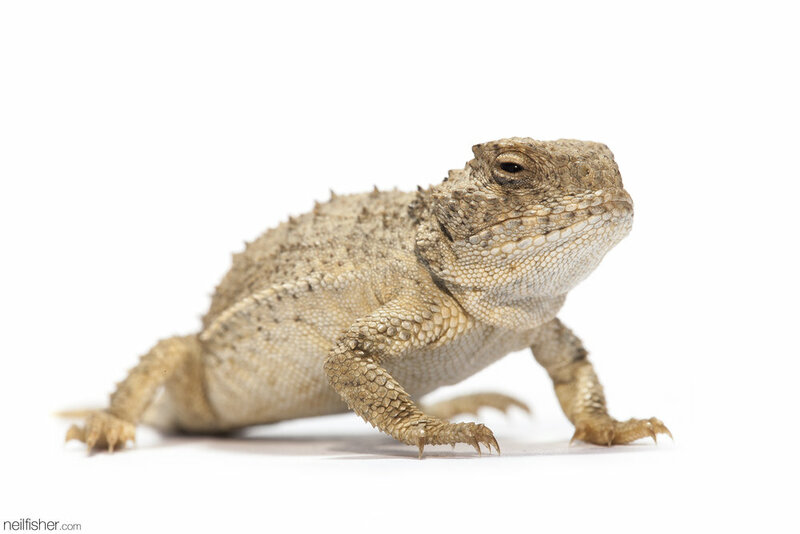 Many organizations are working to better understand and protect the Canadian population of greater short-horned lizards. In 2007 they were listed as Schedule 1 Endangered under the Canadian Species At Risk Act (SARA); giving the lizard substantial federal protection and leading to the development of an extensive recovery strategy. University of Alberta and Parks Canada researchers are using passive integrated transponder (PIT) tags to identify individual lizards, enabling an assessment of the species’ dispersal and over-wintering survival rates. Genetics research is being conducted to determine whether isolated populations are still connected. With the right protection and a strong knowledge of their ecological requirements, the greater short-horned lizard will continue to be a Canadian resident. What recipe lead to my discovery of a greater short-horned lizard? I suppose it was persistence and a bit of dumb luck. I’ve visited Grasslands National Park in Southern Saskatchewan too many times to count and it was simply a matter of time until I encountered one of these miniature living dinosaurs. While walking along the bottom of a south facing slope I spotted this tiny young individual scamper beneath a juniper bush.